The success of 9th International Conference on Bioinformatics has boosted up for another conference. Thus we welcome you to the most exciting event on Adv.Bioinformatics and Drug Discovery to Dublin, Ireland. ConferenceSeries llc Ltd organizes 1000+ Universal events. Every Year across USA, Europe & Asia with sustenance from more than 1000 scientific societies and publishes over 700 Open access journals which implicates more than 100000 eminent personalities, renowned investigators as an editorial board and organizing committee members. ConferenceSeries llc Ltd is ratified by the International Congress as well as Treaty Association. World Congress & International conference as significantly charmed by Nobel Laureate, Universal Symposiums and Workshops, Exhibitions, Keynote gatherings, Exhibitions and Delegates. Henceforth, we comfy you all to be a part of this impressive event to add your novel research concepts. The European Union (EU) is a prevalent hub for advanced research in Bioinformatics. This can be endorsed to the major government funding at both the National and International level from individual EU agencies. The Global Bioinformatics Market is estimated to gain USD 4,285.1 million by 2020 growing at a CAGR of 21.1%. Steady increase in the usage & application of bioinformatics for R&D programs designed for sequencing genomes to better understand biological systems and developing clinical studies in pharmacogenomics and pharmacokinetics for novel drug discovery studies are expected to drive demand for bioinformatics over the next six years. The presence of increasing market appeal for genetic database management, and demand for related sequence, structural and phylogenic analysis tools and software is the dominant factor accounting for this large share in Bioinformatics to catalogue strong progress in the coming years. For more conferences kindly go through conference series web page. This event will provide platform for business delegates, B2B meetings, poster presentations, workshops, symposia, networking and more. 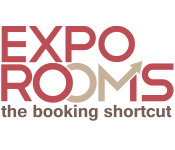 It will offer a platform wherein you can ensure enormous exposure and networking by exhibiting products and services. 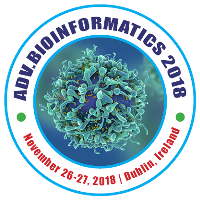 Adv.Bioinformatics 2018 would like to take this wonderful opportunity to welcome everyone interested in Bioinformatics to “12th International Conference on Advancements in Bioinformatics and Drug Discvoery” that is scheduled at Dublin, Ireland during November 26-27, 2018. The theme of the conference is “New Assessments and Tools in Bioinformatics”. The conference focuses on foremost topics such as Bioinformatics, Drug Discovery, Computational Biology & Metabolomics, Genomics & Proteomics, Biomedical & Health Informatics, Epitranscriptomics, Theoretical Biology & Bioinformatics, Pan Genomics, Biodiversity informatics, DNA Punctuation, Moonlighting Proteins, Systems Biology, Immunology and Genetics, Algorithms & Databases, Biomedical engineering & Imaging, Biostatistics, Structural & Evolutionary Bioinformatics, Clinical Case Reports, Protein Bioinformatics, Clinical Bioinformatics and Pharmaceutical Bioinformatics. The conference Adv.Bioinformatics 2018 is a specially designed bundle meeting that involves an ample range of critically significant sessions. It would lay a platform for the interaction between experts all over the world and intends in advancing the scientific discoveries. Adv.Bioinformatics Conference has a strong prominence on support and inspiration for the succeeding cohort of scientists, along with early-career researchers, a Young Researchers Forum, and accomplishments to boost dealings with peers and experts. Altogether the Congress aims to be an exemplary cross-discipline congregation in Biomedical Informatics in Medical and life sciences for research presentation, discussion, learning, inspiration and encouragement with participants leaving with new explorations and concepts, and conceivably the beginnings of International collaborations and friendships. Bioinformatics, an amalgam science that associates biological data with techniques for information storage, distribution, and analysis to support compound areas of scientific research, comprising biomedicine. It is nurtured by high-throughput data-generating experiments, including genomic sequence. Nevertheless, the ends of bioinformatics are integrative and are aimed at presuming out how combinations of diverse types of data can be used to apprehend natural phenomena, including organisms and disease. 15th Annual Rocky Mountain Bioinformatics Conference Dec 07- 09, 2017 Snowmass Village, United States; The Pacific Symposium on Biocomputing (PSB) 2018 Jan 03-07, 2018 Kohala Coast, United States; 9th International Conference on Bioinformatics Models, Methods and Algorithms Jan 19 – 21, 2018 Funchal Madeira, Portugal. It is obsessed by science yet progressively guided by pharmacology and the clinical Sciences, sedate look into have contributed more to the encroachment of drug discovery the previous century than some other logical factor. Augmenting the art of medication advancement and order is critical in satisfying the general wellbeing. The coming of atomic science and, specifically, of genomic sciences is deeply affecting medication disclosure. Accentuation is set on the complexity between the scholastic and modern research working situations, which can impact the viability of research coordinated effort between the two groups, however which assumes such a vital part in drug development. A branch of chemistry that utilizations computer aided drug design to help with taking care of compound issues is Computational chemistry. It utilizes strategies for theoretical chemistry, consolidated into effective computer aided drug design programs, to figure the structures and properties of atoms and solids. Computational chemistry is a branch of chemistry that utilizations computer aided drug design to help with taking care of compound issues. It utilizes strategies for theoretical chemistry, consolidated into effective computer aided drug design programs, to figure the structures and properties of atoms and solids. Pharmacokinetic properties of chemicals are affected by the route of administration and the dose of administered drug. These may affect the absorption rate. 5th International Conference on Glycobiology August 27-28, 2018 Toronto, Canada; International Conference on Computational Biology and Bioinformatics Sep 5-6 2018 Tokyo, Japan; 14th International Conference on Structural Biology September 24-26, 2018 Berlin, Germany; 4th Glycobiology World Congress September 17-19, 2018 Rome, Italy ; 4th International Conference on Genetic and Protein Engineering Dec 05-06, 2018 Chicago, USA; 12th Pharmaceutical Sciences and Pharma Industry Conference February 26-27 2018 at London, UK; 9th Pharmacovigilance Exhibition, June 21-22, 2018 at London, UK; 4th Conference on Antibiotics Conference, June 14-15, 2018 at Barcelona, Spain; 13th International Conference on Metabolomics and Systems Biology June 11-12, 2018 London, UK; International Systems Biology Conferences, November 10-13, 2018, Heidelberg, Germany; Annual Systems Biology Conferences, May 07-08, 2018, Dubai, UAE; BioSB 2018 Bioinformatics Conferences May 15-16, 2018, Lunteren, Netherlands ; World Computational Biology Conferences, March 19-21, 2018, Las Vegas, Nevada, USA. The structure of central dogma of molecular biology and innovation of classes of non-coding RNAs expose biological pathways concerned in disease. Study of posttranscriptional changes with vigour in both protein-coding and non-coding RNAs reveals a new complexity in gene regulation. Thus leading to 'Epitranscriptomics'. To identify and describe RNA modifications and to recollect lab techniques combined with high-throughput sequencing technology and computational methods. Organised with bioinformatics approaches and wet lab methodologies which support in the discovery of novel RNA modifications and description of their biological functions and identification of the molecular protagonists involved in the regulation of such phenomena which in turn provides a great impact in addressing the vulnerable questions and trials of this pioneering field. 3rd International Conference on Lipid Science & Technology December 11-12, 2017 Rome, Italy; 3rd International Conference on Enzymology and Molecular Biology, March 05-06, 2018 London, UK; 4th World Congress On Protein and Bio-Medical Engineering March 15-16, 2018 Singapore; 3rd International Conference on Molecular Medicine and Diagnostics April 19-20, 2018 Dubai, UAE; 4thInternational Conference on Glycobiology and Glycochemistry May 16-17, 2018 Singapore; 15th Annual Rocky Mountain Bioinformatics Conference Dec 07- 09, 2017 Snowmass Village, United States; The Pacific Symposium on Biocomputing (PSB) 2018 Jan 03-07, 2018 Kohala Coast, United States; 9th International Conference on Bioinformatics Models, Methods and Algorithms Jan 19 – 21, 2018 Funchal Madeira, Portugal. Computational biology are interconnected disciplines allowing computational methods to analyse biological data and develop algorithms and analytical methods by acquiring knowledge from various disciplines like computer science, physics, statistics etc. This field is gaining importance in various research fields like Neural Networks, Artificial Intelligence for developing algorithms. It is used in developing bioinformatics software and tools for drug designing, molecular simulations, drug discovery, molecular modelling and numerous biological databases. Subfields related to this topic are computational immunology, computational pharmacology, computational neuroscience, computational cancer biology etc. Metabolomics is outlined as the ample analysis of metabolites in a biological specimen, thus is an embryonic technology that holds potential to inform the drill of precision medicine. The objective of precision medicine is to design disease prevention and clinical care approaches taking into depiction individual variability in environment, lifestyle, genetics, and molecular phenotype. Metabolomics presents a significant analytical confront because, unlike genomic and proteomic methods, it aims to measure molecules that have disparate physical properties. 5th International Conference on Glycobiology August 27-28, 2018 Toronto, Canada; International Conference on Computational Biology and Bioinformatics Sep 5-6 2018 Tokyo, Japan; 14th International Conference on Structural Biology September 24-26, 2018 Berlin, Germany; 4th Glycobiology World Congress September 17-19, 2018 Rome, Italy ; 4th International Conference on Genetic and Protein Engineering Dec 05-06, 2018 Chicago, USA; 13th International Conference on Metabolomics and Systems Biology June 11-12, 2018 London, UK; International Systems Biology Conferences, November 10-13, 2018, Heidelberg, Germany; Annual Systems Biology Conferences, May 07-08, 2018, Dubai, UAE; BioSB 2018 Bioinformatics Conferences May 15-16, 2018, Lunteren, Netherlands ; World Computational Biology Conferences, March 19-21, 2018, Las Vegas, Nevada, USA. Systems biology includes the study of systems of biological components, which may be molecules, cells, organisms or entire species. Systems Biology deals with data and models at many different scales, from individual molecules through to whole organisms. Computational systems biology addresses questions fundamental to our understanding of life and progress here will lead to practical innovations in medicine, drug discovery and engineering. It aims to develop and use efficient algorithms, data structures, visualization and communication tools with the goal of computer modelling of biological systems. Systems Biology approach harnesses the power of computation and systems-level analyses to formulate and solve critical biological problems. This integrative approach of systems biology will close the loop from individual genetics to populations, and constitute the strongest asset for the successful translation of systems biology findings to clinical applications. 3rd International Conference on Lipid Science & Technology December 11-12, 2017 Rome, Italy; 3rd International Conference on Enzymology and Molecular Biology, March 05-06, 2018 London, UK; 4th World Congress On Protein and Bio-Medical Engineering March 15-16, 2018 Singapore; 3rd International Conference on Molecular Medicine and Diagnostics April 19-20, 2018 Dubai, UAE; 4thInternational Conference on Glycobiology and Glycochemistry May 16-17, 2018 Singapore; The Trascriptome EMBL Conference, Apr 25 - 27 2018 Heidelberg, Germany; 10th International Conference on Bioinformatics and Biomedical Technology (ICBBT 2018) May 16-18, 2018 Amsterdam, Netherlands; 20th International Conference on Molecular Biology, Biochemistry and Biotechnology during May 28-29, 2018 Tokyo, Japan. Biological systems are intricate systems made of many spatially circulated building blocks. Accepting the evolution, dynamics and emergent behavior of composite biological systems involves a systems biology approach, relating quantitative biology, mathematical modelling, computer simulation and bioinformatics. Molecular biology is generating information on the molecular properties of cells and organisms at an incredible pace. Bioinformatics is obviously needed for the storage and primary analysis of these huge volumes of biomolecular data. Theoretical Biology & Bioinformatics practices computational methods to report biological questions within their own biological focus area. It covers a range of biological areas, including immunology, evolutionary genomics, evolutionary development, bacterial evolution, and multi-level evolution. Some use bioinformatics, whereas others use modeling and quantitative biology, or evolutionary agent based modeling. Pan Genome is the full supplement of genes in a clad/species. The importance of the pan-genome turns up in an evolutionary framework, especially with relevance to Metagenomics, but is also used in an extensive genomics framework. The Pan Genome considers the aspects of the “core genome” which represents in all the strains, “dispensable genome” also present in two or more strains and “unique genome” specified to single strains. The two types of Pan Genomes are Closed Pan Genome which has insufficient genes added per additional sequenced genome whereas Open pan Genome have sufficient genes added per additional sequenced genome. 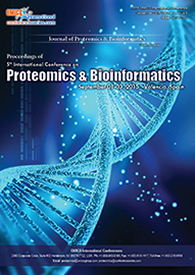 Proteomics is a branch of molecular biology that is concerned with the systematic, high-throughput approach to protein expression investigation of an organism or a cell. It is a large-scale comprehensive study of a specific proteome, including information on protein affluence, their variations and alterations, along with their interacting partners and networks, in order to discern cellular processes. Proteomics enables the understanding the structure, function and interactions of the entire protein content in a specific organism. 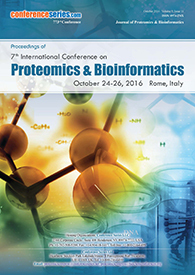 Bioinformatics for proteomics has grown significantly in the recent years. Genomics includes the study of genomes, particularly the set of techniques, analytical methods, and scientific questions related to the study of complete genomes. Scientists have progressed from the analysis of a small number of genes to the analysis of thousands of genes, from the study of the units of inheritance to the whole genome of an organism. Genomics straps the availability of complete DNA sequences for entire organisms by the latest next-generation sequencing technology. Genomics and bioinformatics are now poised to revolutionize the healthcare system by developing customized and personalized medicine. Presentation of informatics to Biodiversity is to progress management, performance, innovation, analysis and investigation. It is a new discipline with hundreds of experts worldwide involved with the design and edifice of biology information system. It is made on the basis of taxonomic, biogeographic and ecological information stockpiled in digital form using current computer techniques to yield novel ways to view and evaluate existing information. Biodiversity informatics though diverse but interrelated to Bioinformatics. Biodiversity informatics may also have to manage with supervision information from unidentified taxa that is produced by environmental sampling and sequencing of mixed-field samples. It is also used to cover the computational problems particular to the names of biological objects, such as the development of algorithms to handle species names and establishments as well as the syntax and semantics by which the content in taxonomic databases can be made machine query able and interoperable for biodiversity informatics resolutions. Experiments to confirm functional roles based on the actual formation of a particular structure are quite laborious and have not yet reached the level of high throughput technology. Thus, computational prediction remains the major tool to reveal genomic DNA regions with the potential to adopt non-B DNA structures. Here we launch a project with the aim to map DNA secondary structures in various genomes from bacteria to human, and assign them a potential probabilistic function based on the methods of comparative genomics, statistics, and machine learning. The computationally predicted DNA secondary structure maps could serve as a roadmap for experimentalists to target specific genomic regions while testing their hypotheses. The project will require both development of bioinformatics algorithms and experimental techniques to facilitate progress in this field. Healthcare Informatics is the application of information technology and informatics to provide healthcare services. It is concerned with the use of information in health care by clinicians. Biomedical informatics (BMI) is the interdisciplinary, scientific arena that educates and follows the effective customs of biomedical data, information, and information for precise survey, problem elucidating and resolution constructing, motivated by exertions to progress social health. Molecular Medicine strives to advocate the understanding of normal body functioning and disease pathogenesis at molecular level. Bioelectronic Medicine is the merging of molecular medicine, neuroscience and bioengineering to develop therapies. Clinical research leads to generation of high-quality, statistically sound and reliable data from clinical trials maintained in Clinical Databases. Bioinformatics tools are profitable in Medical Research helps in the comparison of genetic and genomic data and understanding of various molecules that are amenable for the disease helps to analyze and document the biological systems and pathways. The analytical capability of bioinformatics podium united with clinical data from patient in Electronic Medical Reports can affirm potential biomarkers and clinical phenotypes that allow researchers to develop experimental strategies using selected patient. Structural bioinformatics is a sub discipline of bioinformatics that deals with the three dimensional structures of biomolecules. This field portrays the goals to create methods for manipulating information about biological macromolecules and the application of these methods to solve problems in biology and creating new knowledge. It attempts to model and discover the basic principles underlying biological machinery at the molecular level. Structural bioinformatics combines applications of physical and chemical principles with algorithms from computational science. With the success of the genome sequencing projects, the evolution of high-throughput methods for expression analysis and compound identification, structural bioinformatics is now resurgent and is doing its part to accelerate the drug discovery process. The techniques that structural bioinformatics involves are particularly valuable in the area from target identification to lead discovery. Structural bioinformatics can be used for function and ligand prediction in the case of novel targets. Moonlight acts as transcription factors, crystallins, chaperones, extracellular growth factors and cell surface adhesins. Variability of identified moonlight proteins where one protein will have several functions, the potential profits to the organism of linking two utilities in one protein, and the approaches recommended for a protein to develop a second function recommend that moonlighting proteins might be common. The ability of a protein to moonlight in diverse pathways can confuse the evaluation of protein role from sequence or structure and the footnote of sequence databases. To date, most moonlighting utilities have been found by accident. Currently there is no candid technique to identify a moonlighting protein and sequence homologues of moonlighting proteins do not accomplish both purposes. The research topics include many aspects of moonlighting proteins for examples proteins to moonlight, structures of moonlighting proteins, their protagonists in diseases, how they evolved, moonlighting proteins and proteomics, bioinformatics of moonlighting proteins, etc. Practically about 600 bioinformatics tools were advanced over the past two years, and are being used to facilitate data analysis and its interpretation. Web assistance in bioinformatics provides interfaces that have been developed for an ample array of applications for bioinformatics. The main enhancement derived from the fact that end users do not have to deal with software and database preservation overheads. There are differing software predominant for bioinformatics like open-source, sequence alignment, healthcare, freeware molecular graphics systems, biomedical and molecular mechanics modelling. In more recent advances, the equivalent of an industrial revolution for ontology was pronounced by the apparition of latest technologies representing bio-ontologies. Immunology involves the development and application of methods of bioinformatics, mathematics and statistics for the study of immune system biology. Through drug discovery mechanism new drugs can be discovered and designed and the causes of the diseases can be analyzed and ways could be found to tackle them. The modern drug discovery process integrates the understanding of the molecular basis for a disease with crucial understanding of how potential drug molecules interact with particular disease targets and the whole organism. Bioinformatics is a growing field which can explore the causes of diseases at the molecular level, explain the occurrence of the diseases from the genetic angle and make use of computer techniques to diminish the scope of study and enhance the efficiency of the results so as to curtail the cost and time. Genetics allows us to understand normal events such as development, growth and ageing in terms of the underlying molecular machinery of the cell. Genetics and Immunology, aiming to instil a broad base of knowledge at molecular, cellular and organismal levels. The study in immunology and genetics will help you understand why susceptibility to infectious disease differs between individuals. Identification of genes defining the immune defects may identify new target genes for therapeutic approaches. Alternatively, genetic variations can also help to define the immunological pathway leading to disease. Biomedical Engineering major emphasizes systems engineering and model-based approaches to interpreting, integrating, and using bioinformatics data and trains in molecular biology, systems engineering investigation, and mathematical and computer sciences. Whereas Bioinformatics addresses the flow of genetic, metabolic and regulatory information in living systems to understand the properties of cell and organism. The range of Bioinformatics extents the study of molecular data to quantify clinical, imaging and diagnostic data for custom-built medicine and healthcare. With rapid developments in gene therapy, genetic engineering, gene editing and drug discovery, the field of Bioinformatics provides a varied range of opportunities and career paths for engineers. Biomedical Imaging is a long tactic to visualize biological tissues to improve health of the individual. It includes the development and presentation of new instruments and techniques in magnetic resonance imaging, ultrasound, computed tomography, positron emission tomography and optical imaging. It practices much more complex algorithms. Biostatistics is a branch of applied statistics and deals with developing and applying techniques to summarize and evaluate medical and biological data. The field of biostatistics to bioinformatics furnish quantitative answers to complicated questions from complicated data. The dominant objective of this conference is to conceive a medium for statisticians from across the world to present their latest study, discovery in statistical applications which can prompt novel research projects and directions as well as improve statistical programs. Specialized and technical methods have been made and are currently advancing in the fields of biostatistics and bioinformatics as a mutual resource to exhibit them with a wide range of favourable applications in genetics, genomics, and biomedical areas. The doctrine of biostatistics and bioinformatics will be popularized through driving applications which offers learning approach and therefore, is available to a wide range of fields. Clinical case reports are compelling source of evidence in the field of medicine and is aimed to improve global health and concise about a common or critical clinical scenario and develop a broader search for evidence. Case reports provide detailed information of the symptoms, diagnosis, signs, treatment, and effect of an individual patient. It contains a demographic report of the patient, but usually portrays an unusual or new instance. A favourable case report gives a clear perception about the gravity of the observation being reported. Case report aids in the identification of advanced trends or diseases and discover new drug, its side effects and potential usage. It even analyzes limited manifestations of a disease. Case reports play a significant role in medical discipline thereby administering a structure for case-based training. Protein bioinformatics focuses on understanding the sequence-structure-function relationship of proteins using the techniques in bioinformatics, biophysics and computational biology. It explains all aspects of proteins including sequence and structure analysis, prediction of protein structures, protein folding, protein stability, and protein interactions. It also addresses issues related to disease-causing mutations in membrane proteins, next generation sequence analysis, deep learning in life sciences, proteome-wide annotations and structure-based drug design. With the advent of statistical techniques to infer protein contacts from multiple sequence alignments (which you can read more about here), accurate protein structure prediction in the absence of a template has become possible. 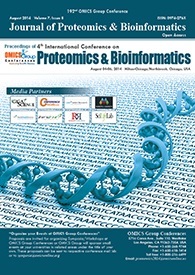 An extensive variety of tools for allocating with different phases of proteins, from their sequences, to their three-dimensional structures, extract biological information from protein structures, summarize large protein sets, study protein interaction and metabolic networks, etc. It is the clinical presentation of bioinformatics, related sciences and technologies to comprehend molecular mechanisms and potential therapies for human diseases. It is pondered to be an innovative and key impression for the improvement of disease specific biomarkers and personalised medicine. It is the invention of combination of clinical informatics, bioinformatics, medical informatics, information technology, and Mathematics together. It furthermore aids in selecting the suitable tool to analyse the data obtained from microarray techniques for clinical justification. It shows a vital role in a number of clinical applications which include metabolic and signaling pathways, biomarker discovery and development, omics technology, computational biology, Pharmacomics, Transcriptomics, proteomics, Metabolomics, genomics, high-throughput image analysis, mathematical medicine and biology, protein expression, profiling and systems biology, human molecular genetics, human tissue bank. It is a new mastery in the area of the genomics revolution. It is essential to biomedicine with presentation in areas like pharmacy, medicine, biology and medicinal chemistry. The genomics revolution has given high output methods for massive gene sequencing, chemical synthesis and biological testing. Target approach of this area is on chemical-biological interaction and experimental effort of chemical and biological interactors by cheminformatics and chemometrics methods. A criterion for this will be the successful integration of bioinformatics into most aspects of drug discovery. Some of the methodologies include proteochemometrics, computer-aided molecular design, chembioinformatics databases, biopharmaceutical chemistry including analyses of biological activity, algorithms for chemical software and other issues related to drug discovery. Focus of this area is on how to use bioinformatics tools in drug discovery. The forthcoming progresses of the life science areas will also rely heavily on learning such knowledge. Still all the advanced frontiers in the medical, biological and medicinal chemistry arenas will need good acquaintance here in order to withstand evolution. The 12th International Conference on Advancements in Bioinformatics and Drug Discovery is slated to take place during November 26-27, 2018 at Dublin, Ireland which objects on foremost topics such as Structural & Evolutionary Bioinformatics, Clinical Case Reports, Systems Biology, Proteomics, Genomics, Pangenomics, Algorithms & Databases, Biostatistics, Immunology & Drug Discovery, Biomedical and Health Informatics, Moonlighting Proteins, Biomedical engineering and Imaging, DNA Punctuation, Biodiversity Informatics, Theoretical Biology, Epitranscriptomics and Computational Biology. The past International conferences on bioinformatics strenuous on diverse areas related to Bioinformatics and their extensive applications which have engaged protruding speakers which embraces eminent scientists from premium International Universities and experts from distinguished associations. Formerly organized conference can be seen in conference series webpage. 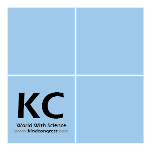 The conference targets to give an elevated base to scientists, academics and furthermore current expert to share and grip any ideas for forthcoming perspectives. This conference will focus these most recent issues and ground-breaking works. It focuses on presenters who hold high profiles i.e. honourable personalities in the field of Bioinformatics and other medical scientists. Individuals from scientific civic are more bent towards Bioinformatics. This gathering advances transposing learning among colleagues and helps the intensifying arrays with novel development in the colossal field of Bioinformatics. Bioinformatics uses improvements in the area of computer science, information science, computer and information technology, communication technology to solve complex problems in life. Data capture, data warehousing and data mining have become major issues for biotechnologists and biological scientists due to sudden growth in quantitative data in biology such as complete genomes of biological classes comprising human genome, protein sequences, protein 3-D structures, metabolic pathway databases, cell line & hybridoma information, biodiversity correlated info. Advancements in information technology, particularly the Internet, are being used to gather and access ever-increasing biological information. Functional genomics, proteomics, discovery of new drugs and vaccines, molecular diagnostic kits and pharmacogenomics are some of the areas in which bioinformatics has become an integral part of Research & Development. With prompt improvements in gene therapy, genetic engineering, gene editing and drug discovery, the field of Bioinformatics provides a diverse range of openings and profession alleyways for engineers. The knowledge of multimedia databases, tools to carry out data analysis and molecular modelling and biological systems on computer workstations as well as in a network environment has become vibrant for any Bioinformatics student. The integrative area, Bioinformatics has developed so much that one allocates it into molecular bioinformatics, organal bioinformatics and species bioinformatics. The significance and utility of Bioinformatics is appreciated in last few years by many trades. Hence, enormous Bioinformatics R & D divisions are being recognised in many pharmaceutical companies, biotechnology companies and even in other conventional industry dealing with biological sciences. Bioinformatics is thus graded as leading career in the field of biosciences. Why it’s in Dublin, Ireland? Europe is one province which incorporates the major segment of the Bioinformatics exploration. Dublin, town of the ford of the hurdles being the economic centre of Ireland, one of the most advanced European economies is bound to hold the chief share in Europe’s Bioinformatics market. Dublin was listed as the fourth richest city in the world. It is an antique and modern centre for education, the arts, administration, economy and industry was listed as a global city by GaWC with an “Alpha-" ranking, which placed the city amid the top thirty cities in the sphere. The organizations like UCD Dublin, Trinity College Dublin and Nsilico, supports academic researchers to Provide end-user analysis support working in the areas of bioinformatics, genomics and molecular evolution the through the progress in sequence alignment, molecular evolution, short peptides, protein structure prediction, cancer, pathogens. UCD inspires multidisciplinary alliances inside and outside. These organizations have created the dynamics that placed Ireland among the developed nations that support research in Bioinformatics. Dublin was European Capital of Science in 2012 and is famous for art, entertainment, shopping, Cuisine, culture, media, science and sports. Paris plays host to leading centres of learning in the European region. Ireland is a home for 24 of the world’s top biotech and pharma companies. Roughly 20 years ago, Ireland had about 50 biopharma companies spread all over the country. Recent numbers put that figure at more than 300 companies. Some companies include Johnson & Johnson, Roche, Pfizer, Novartis, Sanofi, Biogen etc..
By City - Some of the major companies in Dublin. 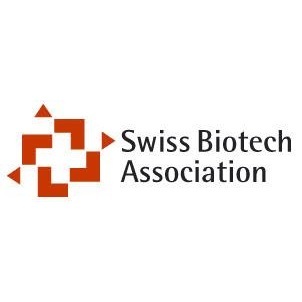 Nuritas- Biotech, Alexo Therapeutics, Alkermes, Allergan, Amarin, Adapt Pharma, Afimmune, Alkermes, DS Biopharma, HiberGene Diagnostics, Horizon Pharmaceuticals, ICON Plc, Leo Pharma, Venn Life Sciences, The Tech Group. B. By Country – Some of the major companies in Ireland. Genomics Medicine, Sigma-Aldrich, Medtronic, Teleflex Medical, Adello Biologics, Boston Scientific, Abbott, Aerogen, Amgen, Pfizer, Integer, BioMarin Pharmaceuticals, Sanofi Genzyme, Eurofins Lancaster Laboratories, Altra Tech. University College Cork, National University of Ireland, Maynooth University, Cork Institute of Technology. European university Switzerland, Vilnius University, Uppsala University, Universita degli study di Torino, Maastricht University, Graz University of Technology, Harvard University, Swiss Institute of Bioinformatics, University of Oxford, Stanford University, University of Cambridge. According to Bcc report, it is estimated that the global bioinformatics market was valued at nearly $2.8 billion in 2011, nearly $3.2 billion in 2012, and is forecast to grow to nearly $7.5 billion by 2017 after increasing at a compound annual growth rate (CAGR) of 18.7%. The bioinformatics market is projected to reach USD 16.18 Billion by 2021 from USD 6.21 Billion in 2016, growing at a CAGR of 21.1% during the forecast period according to MarketsandMarkets report. As per the Allied Market Research, the global Bioinformatics market was valued at $3.4 billion in 2013, and it is expected to reach $12.8 billion by 2020. The market is expected to grow at a CAGR of 21.2% during 2014-2020. Major contributing factors for this growth are increasing application of drug discovery and development using bioinformatics tools, which proves to be cost and time efficient for the pharmaceutical companies. However, the bioinformatics platforms segment is expected to grow at the highest CAGR during the forecast period; high growth in this segment can be attributed to the advantages of bioinformatics platforms, such as reduction in overall time for processing data, phylogenetic analysis, and identification of sequence similarity. By 2020, knowledge management tools are expected to take over platform market and would emerge as the highest revenue generating segment in the overall bioinformatics technology and service market. 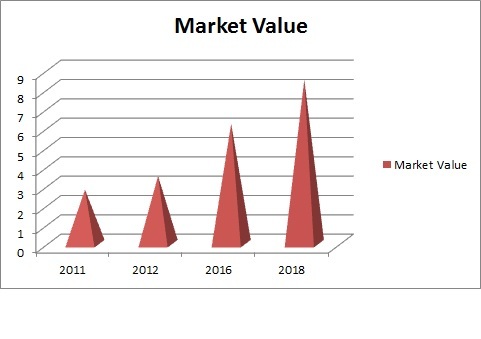 European market will grow from nearly $1.1 billion in 2015 to $1.7 billion in 2019 at a CAGR of 12.0% for the period 2014-2019. The global bioinformatics market is expected to grow at a CAGR of 15.5% between 2014 and 2020. The market was worth US$10.04 bn in 2013 and is projected to reach US$30.87 bn by the end of 2020. The drug development segment is anticipated to lead all application segments. North America is expected to maintain its dominance in the global bioinformatics market with a revenue worth US$11,927.9 mn by 2020. Asia Pacific is expected to witness the highest growth with a CAGR of 18.7% throughout the forecast period. To maintain their position in the global bioinformatics market, the large number of market players operating in the global bioinformatics market are investing in research and development projects. They are also looking forward towards technological advances for increasing application in biosciences and integrated information technology. The top three market players in the global bioinformatics are Affymetrix Inc., Accelrys Inc., and CLC bio A/S. They together comprise approximately 34.6% of the overall global bioinformatics market in 2014. The expansion of biotechnology applications in fields of forensic research and disease diagnosis is drawing the attention of various healthcare organizations and professionals. According to the TMR report, biotechnology with technological and process advancements tends to create high-wage job opportunities in developing and developed countries due to which governments are focusing on the growth of the biotechnology industry. 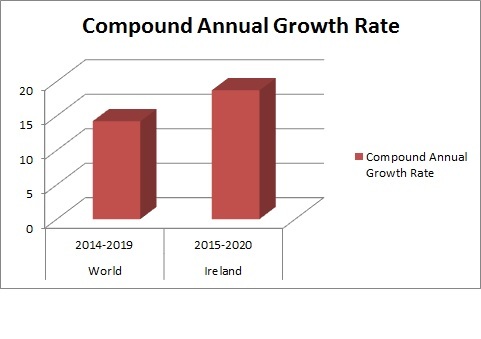 The global bioinformatics market is expected to reach at a five year compound annual growth rate(CAGR) of 14.2% from 2014, 2019 where as in Ireland the market is expected to 18.7% for the period 2015-2020. For better and accurate results, it is imperative that the bioinformatics techniques are operated by skilled personnel. The need for heavy investment in installation and tools upgradation training tends to impede the growth of the industry. Due to this, there is a lack of skilled manpower in the bioinformatics sector who can adapt to sophisticated and high-end biotechnology process and techniques. The scarcity of skilled workers is hindering the growth process of large clinical laboratories as they struggle to automate their processes. On the other hand, the small and medium laboratories have amplified their efforts to abridge and boost their operations with the available resources. Research and development activities also demand highly skilled personnel, but the lack of it is obstructing the growth process making it difficult for organizations and market players to benefit from their research investments. 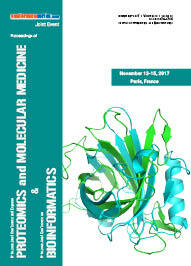 The 9th International Conference on Bioinformatics was held in Paris, France, during November 13-14, 2017. Bioinformatics Congress 2017 witnessed a combination of tremendous speakers who enlightened the gathering with their knowledge and discussed on several fresh topics related to the field of Bioinformatics. The immensely renowned meeting hosted by Conference Series llc Ltd was apparent with the attendance of young and dazzling researchers, business delegates and endowed student communities demonstrating more than 25 countries around the world. The Congress aimed an equivalent support with theme “New Assessments and Tools in Bioinformatics”. The conference captivated a vicinity of apprehensive discussions on novel subjects like Bioinformatics, Drug Discovery, Computational Biology & Metabolomics, Genomics & Proteomics, Biomedical & Health Informatics, Epitranscriptomics, Theoretical Biology & Bioinformatics, Pan Genomics, Biodiversity informatics, DNA Punctuation, Moonlighting Proteins, Systems Biology, Immunology and Genetics, Algorithms & Databases, Biomedical engineering & Imaging, Biostatistics, Structural & Evolutionary Bioinformatics, Clinical Case Reports, Protein Bioinformatics, Clinical Bioinformatics and Pharmaceutical Bioinformatics with the scientific community. The intangible and appropriate knowledge pooled, will also raise organizational alliances to nurture scientific accelerations. The Organizing Committee would like to thank the moderators Dr. Oliva Petra, Sanofi Genzyme, USA and Dr. Marwa Eltoweissy, Georg August Medical University Gottingen, Germany and Alexandria University, Egypt for their handouts in the smooth running of the conference. The conference was embarked with an opening ceremony followed by a sequence of lectures conveyed by both Honorable Guests and members of the Keynote forum. The highlight of the conference was the keynote forum by prominent scientist, Manuel Gea, Co-Founder and CEO of Bio-Modeling Systems, France; gave his worthwhile support in the form of highly illuminating presentation and made the meeting a top notch one. Conference Series llc Ltd is privileged to acknowledge the Organizing Committee Members, Keynote speakers, Chair and Co-chairs on transcribing the plenary sessions and workshops in a diversified and variegate manner to make this conference an enviable artifact. We also express our sincere thanks to all the media partners for the promotion of our event to exaltation. Bioinformatics Congress 2017 congratulates the best poster award winner Dr. Pratibha Sharma, All India Institute of Medical Sciences, India. We once again thank all the accomplices for their magnificent involvement towards the event which helped us in the coup of this event. 9th International Conference on Bioinformatics would not have been efficacious if it has not been buoyed by international, multi-professional steering committee and coordination of the Journal of Proteomics & Bioinformatics, Journal of Pharmacogenomics & Pharmacoproteomics, Journal of Data Mining in Genomics & Proteomics and Journal of Biomedical Data Mining. Success of nine chronological conferences gave us a boost to announce our upcoming conferences which are going to be held in Europe and Asia are “12th International Conference on Advancements in Bioinformatics and Drug Discovery” which is going to be held during November 26-27, 2018 in Dublin, Ireland, “International Conference on Computational Biology and Bioinformatics Aug 24-25 2018 Tokyo, Japan, “12th International Conference on Proteomics and Molecular Medicine” which is going to be held during November 26-28, 2018 Dublin, Ireland. Mark your calendars; we anticipate your gracious presence soon!